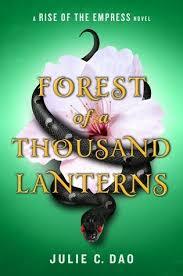 I first heard about Forest of a Thousand Lanterns when mentions of the book EXPLODED all over my Twitter Feed. Suddenly, everybody was talking about this book I hadn't heard of and I (virtually) ran the mile towards Goodreads, read this GORGEOUS book's description and hit the Want to Read button faster than you could say "Snow White Retelling." 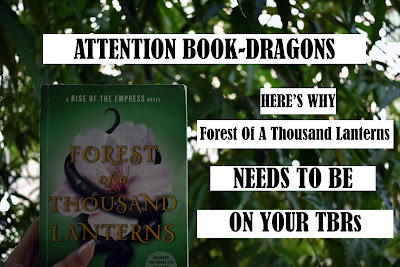 I requested an ARC of Forest Of A Thousand Lanterns on a whim, sure that a small time blogger such as myself would never get approved to read it. To my completely shock, the lovely publicist at PRH International* said she had an extra copy and sent it my way! *I would like to take the time to appreciate the WONDERFUL PRH International whose sole mission it is to get books published in the US to readers all over the world. As someone living in India, everything about their existence makes me happy. I haven't shared my review with you folks yet ( I will closer to publication date) but in short, I LOVED IT MORE THAN ANY OTHER RETELLING I'VE EVER READ and so, I've compiled a list about why YOU NEED THIS BOOK IN YOUR LIVES. If you got that Grey's Anatomy reference, you can be my new best bookish friend. I mean it. 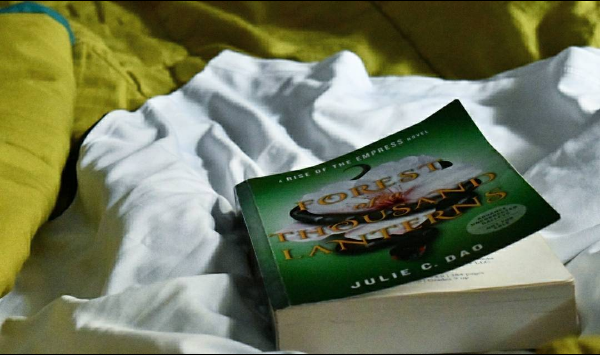 I didn't know what to expect going in with Forest of a Thousand Lanterns being Julie Dao's debut novel. Most of it is set in the palace, filled with politics, ever changing loyalties and characters so deeply explored you'll feel like you've known them your whole life. This book deals with Fate and Destiny and the lengths one girl will go to to get what she has always been told was hers. I loved all the plot twists, the political backstabbing, the romance - EVERYTHING. Julie Dao's lush re-imagined fairy tale, that's probably more Grimm than Disney will stay with you for a long time to come. Her writing isn't superfluous, but still manages to capture the essence of the world around her. More than ANYTHING, she manages to capture the volatile emotion of all the characters in the book. Whether is was the Empress, Lady Sun, Xifeng, the Emperor or ANYBODY, really, she dove into their minds, and dove deep and made me, one of her biggest fans, get to know when well. DON'T YOU AGREE WITH ME? 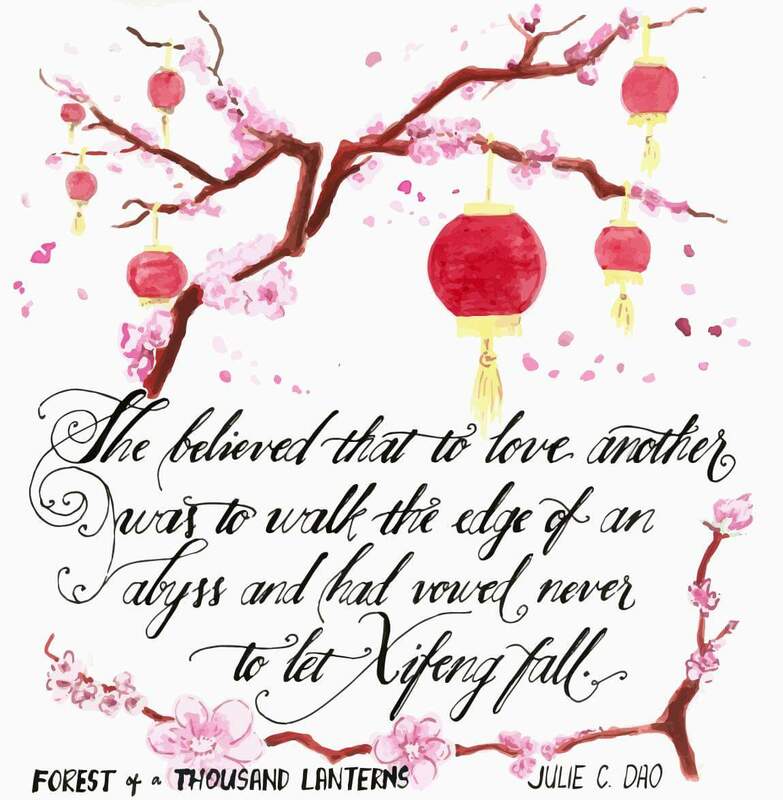 Not only is Forest of a Thousand Lanterns one of the best retellings out there with an anti-heroine as the main character, it's also set in East Asia and it is done GORGEOUSLY. From the descriptions of the city and the palace, to the clothes that everybody in court wore, this book captured the essence of a culture without seeming like it was trying to hard too - and that's the best kind of representation. I'm pretty sure the Snow White from your childhood contained a poison apple, all the happiness, fluffy animals and seven dwarves but this book is nothing like that. It was darker, filled with more character and just plain better. Not only did this book take place in a totally different setting, but the entire tone of the fairy tale had changed. There was a desperation to Xifeng, along with a strong determination that she would live the life she'd been brought up told about and that she would make it to the top and I'm pretty sure you'll love all of it. If you've never heard me say, Give me the worst people in the book and I'll fall in love with them, you have now. Xifeng is one of the BEST anti-heroes or villains that I've read in EVER and the dark, lush nature of this book just made this THAT MUCH BETTER. If you’re looking for that unpredictable, diverse and dark fantasy book, go throw this book to the TOP of your TBRs and Wish lists. Forest of A Thousand Lanterns will have you spell bound with its intense writing, captivated by its ruthless main character and in love with the world you’ve been transported to. Blurb Description: An East Asian fantasy reimagining of The Evil Queen legend about one peasant girl's quest to become Empress--and the darkness she must unleash to achieve her destiny. Julie is represented by Tamar Rydzinski of the Laura Dail Literary Agency. 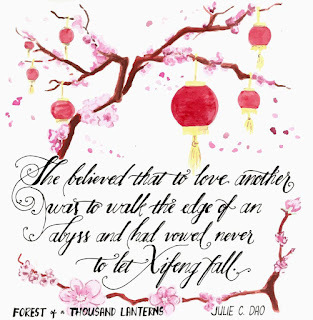 Have you heard of Forest of a Thousand Lanterns? Is it on your TBRs? Have you already read it - and if so, what did you think of it? What are some of your favourite retellings?